The gallbladder is a sac that stores and releases bile, which breaks down fats in the body. During the process of fats being broken down, a gallstone is sometimes formed. This is solidified material that blocks the necessary flow of bile. Commonly, this is treated with surgery to remove the gallbladder. The traditional surgery is called an open cholecystectomy. While a patient is under general anesthesia, surgeons cut an incision under the ribs and move the liver in order to remove the gallbladder. Most gallbladder surgeries are now performed using laparoscopic cholecystectomy, which is minimally invasive. However, mistakes still may occur during this process that harm a patient, and a Chicago laparoscopic cholecystectomy malpractice lawyer may be able to assert their rights. The experienced medical malpractice lawyers at Moll Law Group are ready to help you pursue compensation. 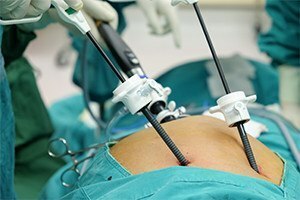 In a laparoscopic cholecystectomy, the surgeon makes a small incision in the abdomen and inserts a hollow tube into which a video camera is threaded. More of these tubes are inserted into other small incisions to clip ducts and vessels. It is crucial that each artery and cut is properly identified so that the right ones are clipped because it is possible to mistakenly clip the common bile duct or nearby organs, which can lead to serious injuries or death. The gallbladder is removed through the incision. Usually, recovery from this procedure is shorter than recovery from traditional surgery, and most patients stay in the hospital for hours or overnight, rather than days. A common mistake in these procedures is accidentally cutting the common bile duct, which empties bile from the liver into the small intestine. When toxic bile leaks into the abdomen, very significant complications can occur, and the patient may need another surgery to repair the bile duct and drain bile from the abdomen. The laparoscopic cholecystectomy malpractice attorneys at our Chicago firm know that the incidence of bile duct injury associated with this procedure is twice that of open cholecystectomy. The consequences may be severe. When the duct cannot be repaired, a patient might need permanent tubes to drain the bile into an external tube. If nearby organs are cut or perforated, acute sepsis may occur. Malpractice occurs if a surgeon fails to act in accord with the standard of care, thereby causing an injury to the plaintiff. Clipping the bile duct or cutting organs in some cases is a known complication of the procedure, but in some cases it may be considered a failure by the surgeon to abide by the reasonable standard of care. Therefore, it is necessary for an expert surgeon to provide an opinion about the specific facts of the surgery that is at issue. Often, the negligence is not in the complications themselves, but in how the complications are recognized, repaired, or managed after the laparoscopic cholecystectomy. In some cases, the best interests of a patient necessitate that he or she be stabilized and transferred to another center that has more experience repairing ductal injuries. Malpractice can also occur as a result of errors by the surgical team, such as carelessness by a nurse or other staff member who is responsible for sterilizing the equipment or properly monitoring the patient after the procedure. If you suffered injuries or lost a loved one due to laparoscopic cholecystectomy negligence, you should consult the Chicago laparoscopic cholecystectomy malpractice attorneys at Moll Law Group about whether you have a case as soon as possible. Our firm represents people in Naperville, Schaumburg, Wheaton, and cities throughout Cook County. Billions of dollars have been recovered in cases in which we were involved. Call us at 312-462-1700 or complete our online form to schedule a free consultation with a surgical error attorney.